I’m just back from Columbus, Georgia after participating in the 20th annual School of the Americas Watch gathering over the weekend Nov. 19-21. The School of the Americas, also called the School of the Assassins, located at Fort Benning trains troops of Central and South American repressive regimes in police state tactics, including torture. I was named by Pax Christi USA as their 2010 Teacher of Peace and given an award as part of the weekend activities. Each year Pax Christi USA names one Teacher of Peace. Some of the past Teacher’s of Peace are: Daniel Berrigan, SJ, Fr. Roy Bourgeois, MM, Shelley and Jim Douglass, Bishop Thomas Gumbleton, Kathy Kelly, Archbishop Raymond Hunthausen, Martin Sheen, Helen Prejean, CSJ, Liz McAlister and Fr. Louis Vitale, OFM. I’m a small potato compared to the above spiritual giants, but I told the gathering that I accepted the award on behalf of all the small potatoes of the world standing up to ending the war against the planet (the poisoning of land, water and air) and making peace with mother earth. Beyond the wars against Iraq, Afghanistan, etc. — the wars for oil, are the wars for food, wars for water, wars against species, so it is good to honor all the small potatoes who believe we need to end all the wars. All species, people, cultures should be respected and the resources of the earth should be shared in a just, sustainable manner. The weekend activities were very inspiring. It was great to see such a cross cultural/age gathering of thousands. The entire weekend was very well organized with lots of workshops, speakers, and music. The weekend concluded at the main gate of Fort Benning with a solemn procession of people holding crosses and the chanting of thousands of names of those killed by people trained at the School of the Americas. Several dozen were arrested in peaceful protests over the weekend in acts of conscience. The work will continue on many levels until the School is shut down. Below are a few links for more info. “When we think of wars in our times, our minds turn to Iraq and Afghanistan. But the bigger war is the war against the planet. This war has its roots in an economy that fails to respect ecological and ethical limits – limits to inequality, limits to injustice, limits to greed and economic concentration. “Making peace with the earth was always an ethical and ecological imperative. It has now become a survival imperative for our species. Violence to the soil, to biodiversity, to water, to atmosphere, to farms and farmers produces a warlike food system that is unable to feed people. One billion people are hungry. Two billion suffer food-related diseases – obesity, diabetes, hypertension and cancers. “The elevation of the domain of the market, and money as man-made capital, to the position of the highest organizing principle for societies and the only measure of our well-being has led to the undermining of the processes that maintain and sustain life in nature and society. The richer we get, the poorer we become ecologically and culturally. The growth of affluence, measured in money, is leading to a growth in poverty at the material, cultural, ecological and spiritual levels. The real currency of life is life itself and this view raises questions: how do we look at ourselves in this world? What are humans for? And are we merely a money-making and resource-guzzling machine? Or do we have a higher purpose, a higher end? “I believe that ”earth democracy” enables us to envision and create living democracies based on the intrinsic worth of all species, all peoples, all cultures – a just and equal sharing of this earth’s vital resources, and sharing the decisions about the use of the earth’s resources. Earth democracy protects the ecological processes that maintain life and the fundamental human rights that are the basis of the right to life, including the right to water, food, health, education, jobs and livelihoods. PS. Reminder: Hawaii’s soil is contaminated with a wide range of toxins, including depleted uranium from military training. 4. Oppose all discrimination, anti-Islamic, anti-Semitic, etc.5. Seek peace through justice in Hawai`i and around the world. Ray McGovern works with Tell the Word, the publishing arm of the ecumenical Church of the Saviour in Washington, DC. During his career as a CIA analyst, he prepared and briefed the President’s Daily Brief and chaired National Intelligence Estimates. Bush authorized and expanded extra-judicial imprisonment and torture. Obama has not only failed to follow through on his promise to close Guananamo Bay prison, but also has authorized extra-judicial killings. Shame on Bush! Shame on Obama! Saturday, December 4th, there will be a volunteer farm day at Malu ‘Aina from 9-11AM. Call 966-7622 or email ja@interpac.net for directions. Weather permitting, we’ll be planting kalo and there will be volunteer jobs for all ages and skill –from keiki to senior citizens. Come and lend a hand to plant food to share with people in need and support the work of justice and peace. Following the work, we will have a pot luck lunch and talk story. 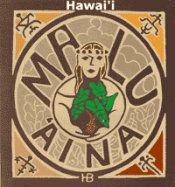 It’s a good day to reconnect with the ‘aina and one another. Who’s on the “Hit” List? WASHINGTON – The Obama administration argued on Nov. 8th before a federal court that it should have unreviewable authority to kill Americans the executive branch has unilaterally determined to pose a threat. Government lawyers made that claim in response to a lawsuit brought by the American Civil Liberties Union and the Center for Constitutional Rights (CCR) charging that the administration’s asserted targeted killing authority violates the Constitution and international law. The U.S. District Court for the District of Columbia heard arguments from both sides today. The government filed a brief in the case in September, claiming that the executive’s targeted killing authority is a “political question” that should not be subject to judicial review. The government also asserted the “state secrets” privilege, contending that the case should be dismissed to avoid the disclosure of sensitive information.